Carrie - There's a real shift in education at the moment towards STEM and all of these can be taught through the arts which is what we're quite excited about. There's also this shift towards project base learning, this idea that you can actually learn a lot of subjects and a lot of skills just doing one project. It gives you that kind of real world relevance and it makes it engaging for children and they can see the point of it rather than having these separate subjects that don't really mean anything to each other. Connie - Kind of moving away from that classic blackboard route learning. Connie - I guess it's rare that a school will be able to do something like this that often. So, how easy is it to get on a smaller scale more application base learning into schools and into kind of day-to-day lessons? Carrie - I think it comes a lot of it from parents or from the community. I mean, the reason we're able to do this, is thanks to community members like Dave who's here to do the balloon launches. I think schools can actually tap into a whole bunch of enthusiastic groups in science and in technology. Who will come and help them and help them build these projects and show them some real world relevance? Connie - What the High Altitude Ballooning Society and a computer programming hardware called Raspberry Pi have done is combined both approaches. Pupile can encode the hardware or Raspberry Pi to collect whatever data they want as the balloon flies from A to B. Today, scout leaders and teachers of primary schools and secondary schools are testing it out and launching a Raspberry Pi onto the borders of space. There are 4 groups who will work together to launch a balloon and then again, after the training, when they take their kit, a new learning back to their schools. Connie - Okay, so where are we going? Ted - We're heading towards Norwich which is the region in which we think the balloon should come down according to all the predictive software. Carrie - Okay, but we've also got - we're looking at the software now and we just got our first photo for it, right? Ted - Yup! It's downloading, sending down photographs that have been uploaded to the internet to a web server and it's also sending its GPS position so we know exactly where it is. Connie - That was teacher Ted. I joined him and the rest of his group for the chase. It was a long car ride with 3 of us squished in the back and for the most part, it was pretty sedate - driving along as we tracked the balloons ascent 28 kilometres to the edge of space. But suddenly, things started to get a little more tense. The balloon had burst and was falling steadily. We're stuck at a very long traffic light and the balloon is currently at what? Ted - One and a half kilometres high. Connie - And seconds from the sea. So, we really want to get there so we can see it land because it could be that it goes into the sea. Ted - So we can see the splash. Connie - So now, we really are picking up the speed and it's all got a lot more dramatic. 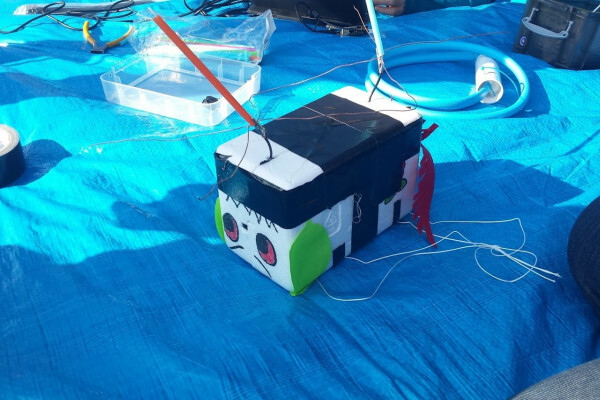 Luckily, the GPS told us that we had narrowly missed the sea and the balloon fell in land to a large open field where we found ourselves searching for the payload - a small polystyrene box that was attached to the balloon and had all the equipment. Of course, when the kids do it, their payload could land anywhere - from someone's garden, to the middle of a river, to the top of a tree. Ted - Alright, we need to pull in somewhere here. Carrie - There's people here. Maybe they've got it there. Ted - Excuse me. I don't suppose you saw a parachute come here, did you? Connie - So, this is the radio. Is it buzzing because we're nearby? Ted - That signal is coming from our spacecraft in this field. Connie - Okay, we're going to climb the fence. I found it. Ted - Found it by the look of it. Carrie - This is amazing. Ted - I can't believe that this has been to space and it stayed on. Connie - So that was that. In around 2.5 hours, our payload had gone all the way to the outer reaches of the atmosphere and come back down to land in a field near the east coast - quite a day really. Back at base, I got to catch up with James Robinson from Raspberry Pi and find out a little more about what the project would actually do for kids in schools. James - The aims of the project is to really show young people how the combination of science, technology, math and engineering can achieve really spectacular results. So, there's lots of cross curricular potential with the project. So, you've got the science of the forces that were involved, how we get something from the ground to high altitudes, you've got pressure. There's loads of calculations involved in how we predict the flight path of the balloon so we know we can recover it. You've got the programming side of things so it's the software that governs how the tracker device works and then the other aspects, the arts and the English, and other sort of curricula that could be linked into this. So, telling the story of the journey of the balloon and the items that the kids have placed inside. So yeah, we think it's a really cross curricula project. What's the fastest way to the shoe shop?